AP Home Department - Distribution of Rs.250 crores to the Agri-gold victim depositors of Andhra Pradesh, who have deposited Rs.10,000/- and below - Administrative Sanction - Accorded – Orders - Issued. AP HOME (GENERAL-A) DEPARTMENT G.O.MS.No. 31 Dated: 07-02-2019. 10,000 Rupees Distribution for Agri Gold Depositors as per GO 31 Dt. 07-02-2019 AP Government have taken a decision to sanction an amount of Rs.250.00 crores to disburse the said amount to the victim depositors of Agri Gold, who have deposited Rs.10,000/- and below, whose identity is established. 1. From the Director General of Police, Andhra Pradesh, Vijayawada, C.No.1581/C-13/CID/2017, dated 26.04.2017. 2. Status Note on Agri-Gold received from the Addl. D.G.P., C.I.D., A.P. dated 21.1.2019 & dated 30.1.2019. In the reference 1st read above, the Director General of Police, Andhra Pradesh has stated that the Agri-Gold Group of Companies have collected deposits offering high rates of interest or with a promise to register a piece of land in lieu thereof. However, the Group of Companies have neither repaid the deposits to the depositors nor did they register any land in the depositors’ names. Based on the complaints of aggrieved depositors, several cases have been registered at various Police Stations in Andhra Pradesh State. Later those cases have been transferred to Crime Investigation Department for further Investigation. During the C.I.D investigation, it is revealed that M/s. Agri-Gold Farm Estates India Private Limited and other group of companies were started by Sri Avva Venkata Rama Rao and others in Vijayawada during the year 1995. The accused companies collected deposits amounting to Rs.6,380 crores from around 32 lakh depositors from all over the country. The company also defaulted to a tune of Rs.500 crores to various Banks. Further, the cheques issued by the companies worth around Rs.700 crores were dishonoured by various banks. The default by the Agri-Gold Group of Companies created widespread distress and panic among lakhs of depositors who lost their life time savings, having deposited in the company. 2. In view of the above, Government have taken a decision to sanction an amount of Rs.250.00 crores to disburse the said amount to the victim depositors of Agri Gold, who have deposited Rs.10,000/- and below, whose identity is established. 3. 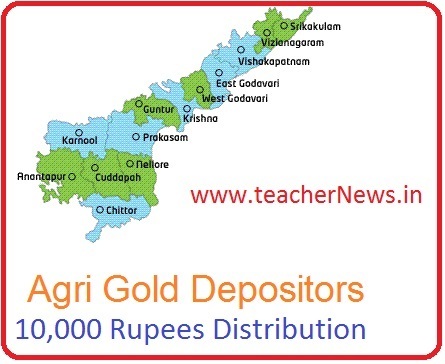 Government after careful examination of the matter, hereby sanction an amount of Rs.250 crores (Rupees two hundred and fifty crores) as an immediate mitigating measure to provide solace to the Agri-gold depositors of Andhra Pradesh who deposited Rs.10,000/- and below, in advance as the distribution out of the sale proceeds is delayed due to various circumstances, subject to reimbursement of the same from out of the monies fetched through sale of Agri-gold properties through auctions conducted by Court and the District Level Committees monitored by Court. 4. The Advocate General to appraise the Hon’ble Court in this regard and obtain necessary orders so that payments are made only to the genuine depositors and also for accelerating the sale process carried out by the District Level Committees and monitored by Court. 5. This order issues with the concurrence of the Finance (FMU–H&C) Department vide their U.O.No. FMUOASD (HCL)/4/2019, dated 7.2.2019. Agri Gold - Distribution of Rs.250 Crores to Gari Gold Victim Depositors of AP who have deposited Rs.10,000/ GO. 31 అగ్రిగోల్డ్ బాధితులకు చిన్న మొత్తాలు డిపాసిట్ చేసిన వారికి తిరిగి ఇవ్వడానికి ప్రభుత్వం 250 కోట్లు రూపాయలుకేటాయించింది.